downpours. As far as I could tell it didn’t dampen the enthusiasm of the ten skippers from 5 different clubs to much. “Raptor” theme. Those with a long memory would have been interested to see the old Ian Taylor “Batman” design represented. One thing we did have plenty of was the wind. Rig choice and ability to handle it was critical and there was a wide range of rig across the boats. There did not seem to be a great deal of difference in the ability of the top few boats but Chris Harris’s sailing was outstanding. Not that he didn’t have to fight for it at times. Vernon Appleton in particular gave him work to do provided he got a good start which was not always the case! Downwind the Sybora had a definite edge and on some of the occasions that Vernon got a lead Chris went past on the run. Others too managed to do well downwind and even went past Chris so perhaps some of it was to do with getting in the right stream of wind and managing to keep the boat from broaching or nose-diving and there was plenty of that. Add to that choosing the right rig and there was plenty of scope for folks to take places from those ahead. As the results show (See ‘Results’ Page) Chris won nearly every race (11 out of 15) though he did ‘let’ Dad win one! Chief rival Vernon, took the remaining 3. 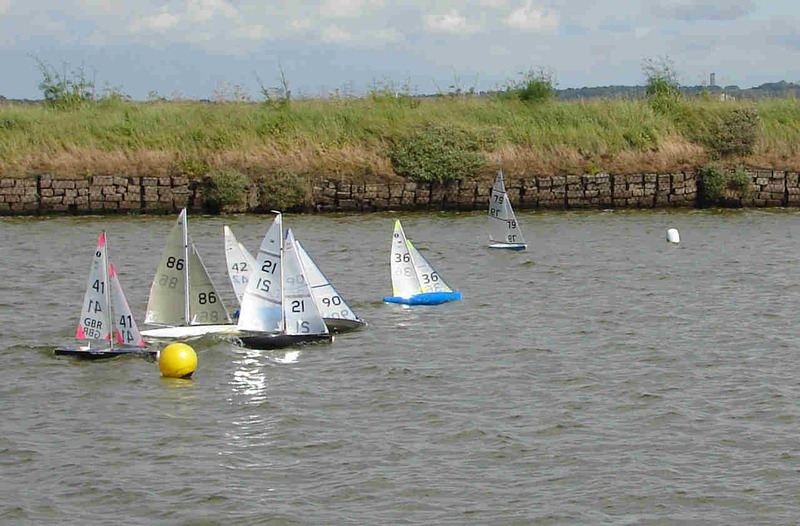 Second places were more widely scattered being shared among the top 6 boats. There were two casualties with equipment that I noted. Mike Harris blew up a rudder servo at the end of race 6 so missed race 7 then it was replaced and was OK for the rest of the event. Looked like a good move as he had his best scores after the replacement! Geoff Appleton had trouble with his winch so failed to finish in race 12 and withdrew from the remaining races. There were very few protests and none came ashore. That was a bit of a disappointment for me, having been appointed jury chairman, as I was denied the opportunity to DSQ anyone! So at the end Chris Harris took the Champions title by a clear margin while Martin Dovey took the Novices trophy for the highest placed skipper who had not won a National Championship or the Novices trophy. Rumour has it that there were spies to see if the venue will be OK for the IOM Ranking events in September. We hope they were suitably impressed! The Race Officer was George Beacroft with Graham Bartholomew, both from the Chelmsford club, assisting. Helping with the observing was Brian Flecknoe from the Swanley club. Yours truly from Lee Valley did the scoring.